« What five things should we teach kids to prepare them for 2050? There is nothing like walking past a ballroom and hearing cheering and laughter. You might think it’s a group of children having fun and if you peek in you would see 12 newly constructed contraptions with marbles speeding through them and 250 adults jumping with anticipation that they are the winning team. And winning what exactly? Nothing but the bragging rights of boasting to fellow work mates that they won the morning teambuilding challenge. What you wouldn’t realize in just walking past is that the teams are also learning key components in how to work more effectively together. Product Pipeline is an ideal program to choose if you are a large group also needing your participants to come away with a learning tool. 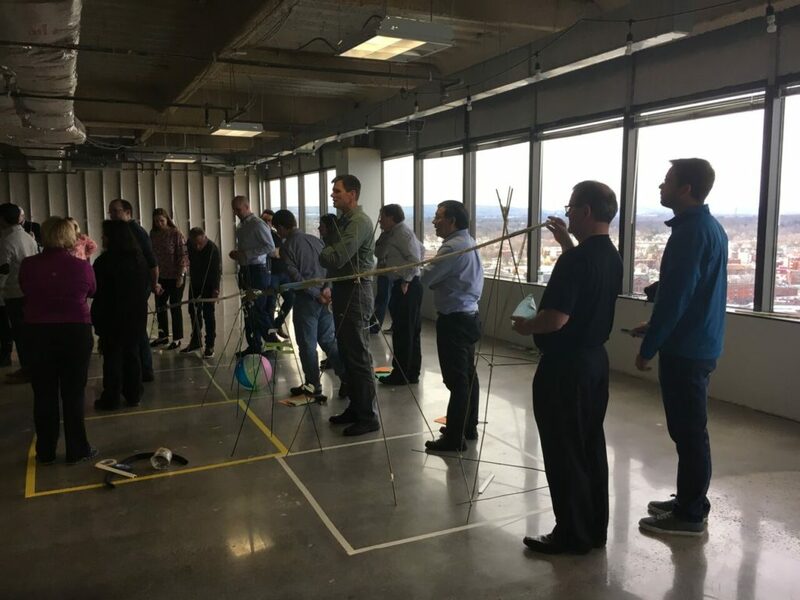 Recently with 250 people, we were able to provide them with a key moment of learning where the action was stopped in order for team leaders to redirect the activity for a better working structure and an effective method of getting the task achieved. 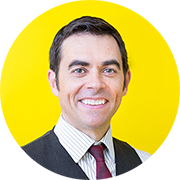 With large groups, the immediate problem is that there will be too many people wanting to take over, and rather than feel this is the reason not to do a training module, it is the perfect opportunity to present solutions for something that happens in a regular working day. Quite often the challenge for large groups, is that a client wants a competitive, energetic program while providing their participants with a learning opportunity. For them to come away with new ideas while still having the wow factor from a lively program that is not a sit down lecture on a new way to work. It is possible to present this but your teambuilding provider needs to fully understand and have experience of programs of this nature for them to be successful. Gimmicks cannot just be relayed on a larger scale. There are programs that will work and those that cannot. Quixote Consulting knows the difference. First, simplify your needs. You will never keep everyone’s attention with too much information. So go for one or two direct points and demonstrate them in an experiential way. Set up and planning is key and this is basic, but allowing time for participants to get from one location to another, including time to check phones and go to the bathroom. 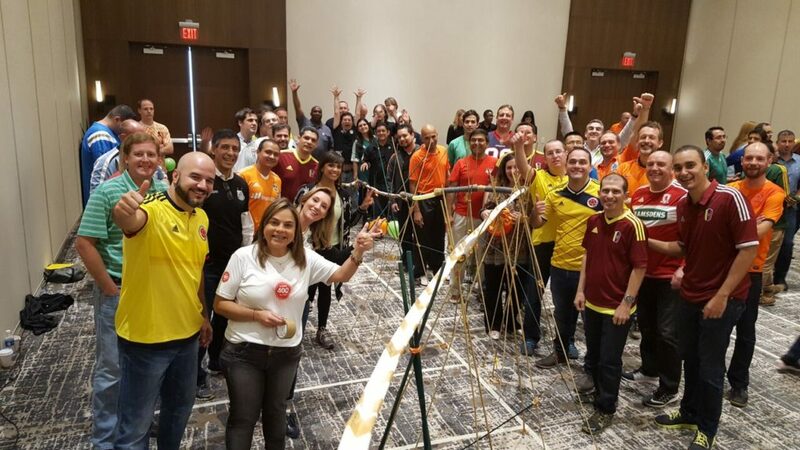 Once your group is all together and the program is underway you do not want them to be thinking about something that could have been solved by including a fifteen minute break before the teambuilding session. Breaking a session half way through is not a good idea. Trust your provider to know their set up requirements, time and space are key for the implementation of large group trainings. Recently for a large Product Pipeline the venue space was measured and divided using every inch available. The organization took three weeks of planning and was worth it to allow each individual an empowering experience. For this particular client, who wanted both training and a burst of high energy to ignite their three day retreat, their success was in trusting us with the planning and delivery. By asking relevant questions we had a clear understanding on their objectives and also the limitations of the venue. 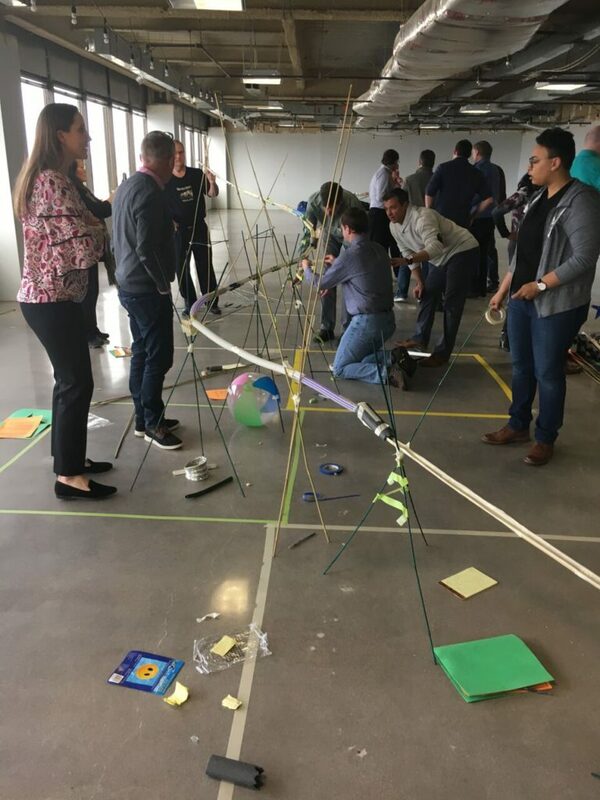 Realistic expectations were set and the freedom to design a program that we knew from our experience would work best, and it did, with three placing teams, an ultimate winning team and people congratulating one another and us – it was three hours of focused learning and therefore winning. PS – Thanks to all who expressed your enthusiasm about our newest baby www.largegroupteambuilding.com – and an offer to anyone who’s on a team, give us a call and we’ll help you change your culture to ‘one team, one goal’. This entry was posted in Team Building, Quest Stories. Bookmark the permalink. Both comments and trackbacks are currently closed.